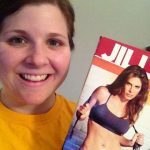 Yesterday I started phase 2 of Jillian Michaels Body Revolution, doing Body Revolution workout 5. Over the next month I will utilize workouts 5, 6, 7, 8 and cardio 2. Yesterday morning I went to Cycle Studio for Cycle Abs and then closed out the day with workout 5. Boy oh boy was workout 5 good. It was definitely more intense than workout 1 but each week builds upon itself so the intensity of workout 5 was just perfect for week 5. I was literally laying on the floor at the end of the workout but I loved it! I am working hard and am uber motivated to continue to lose inches and hopefully pounds as well. This week I am continuing my goal of drinking lots of water. To mix things up I’ve starting drinking Crystal Light every other Nalgene bottle. On top of that I’m striving to decrease my simple carb intake. Sunday night for dinner Neal and I grilled up a bunch of chicken, serving it up along side mashed potatoes and veggies. Well seasoned chicken is so versatile. Yesterday for lunch I added some of the leftover chicken to my salad for some extra protein and then last night Neal used some of the chicken to make a chicken quesadilla. I think cooking up a bunch of protein on Sundays will become a regular thing for us in the future. For breakfasts I’ve turned back to oatmeal for a filling complex carb. 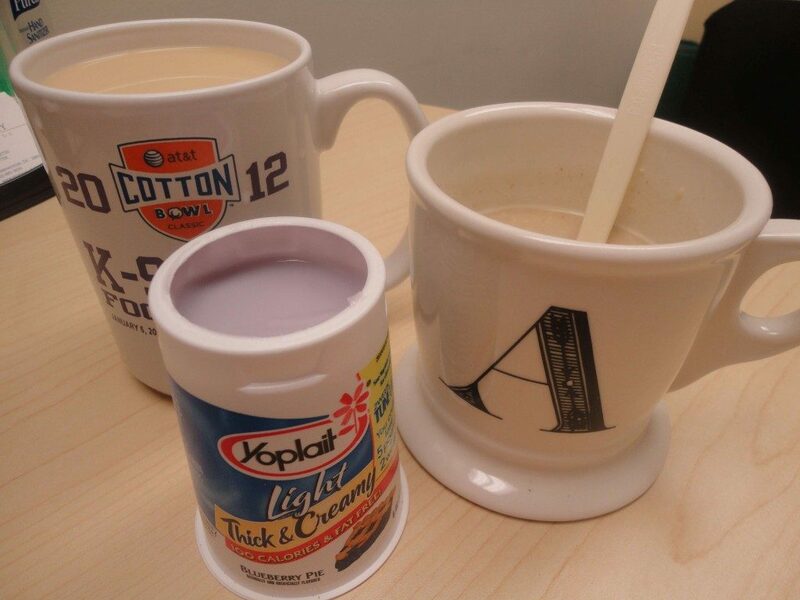 This morning I had oatmeal, yogurt, and a wicked awesome cup of joe (Donut Shop Coconut Mocha to be exact). For lunch today I have roasted eggplant and pasta zero with a little marinara sauce. Eggplant has never been my favorite vegetable but I’m hoping that one of these days my palate will change. For this eggplant I tossed it with a little olive oil, salt, pepper, and red pepper flakes. I then roasted the eggplant at 400 degrees for 25 minutes. After cooling down the eggplant I added 1 cup of marinara sauce and 1 package of pasta zero (my new favorite). Today’s lunch is a great way for me to remain low carb while still enjoying meals that I love (Italian!). All in all, phase 2 has started out great. Tonight I will take on workout 6 and enjoy an evening in with my loves, Neal and the Biggest Loser. I hope y’all have a wonderful Tuesday!